A few weeks ago I was listening to a podcast and Merlin Mann of 43 Folders was talking about a playlist he made in iTunes that he calls “Forgotten Lovers.” Basically, it’s a smart playlist of songs that you’ve tagged over 3 stars and that you havent listened to in over 30 days. Well, I made this playlist because it sounded like it would be good, and I think it is simply amazing. Its a continual hit after hit after hit of your favorite songs. So many come on and I literally find myself going, “Oh, I remember this song! It’s so good!” You should definitely try it out. Of course it requires that you have already reated your iTunes music. You can add other custom rules to make it even more specific. I found that it was putting audiobooks and podcasts in there, which I don’t want, so I also told it to not include those genres. Be creative and learn to enjoy your music all over again! 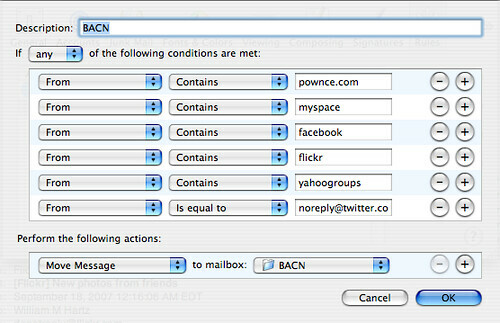 Another little special folder I’ve created on recommendation from news I heard on the Internet is a mail folder called BACN. BACN basically is all that email you get that isn’t quite SPAM, but it not something you want cluttering your main inbox. It can sit nicely to the side and when you are ready for it you can check it in it’s segregation. Basically it’s those emails coming from MySpace or Facebook or Flickr or Pownce or Twitter or other sites like that. They’re important and you want to keep them, but you don’t want to see them right now. Here’s the original video talking about what BACN is. Of course, your’s will probably be different depending on what Social Networking or Web 2.0 sites you belong too. But yeah, control your BACN and rediscover your music, and your life will be happier and the days brighter. Trust me.